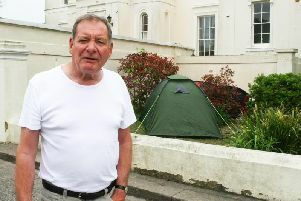 A motorcyclist concerned about traffic has added his voice to other residents who oppose 300 homes proposed for Climping. Hamish Neathercoat lives in Apple Tree Walk in Climping. On Friday, December 12 last year he missed a hospital appointment he had waited three months for due to traffic delays on Horsemere Green Lane. He posted dashcam footage of the delays on YouTube, which illustrate that even a motorbike could not fit through the traffic – and feared that emergency services may struggle to access homes along Horsemere Green Lane if others were built nearby. Now Mulgrave Properties LLP has submitted plans to build 300 homes on land south of the road – and Mr Neathercoat said it was ‘beyond comprehension’ that the number of homes were double the original plan. At a meeting last Tuesday, Clymping Parish Council announced it would lodge an objection with Arun District Council, who will decide on the planning application. Colin Humphris, parish council chairman, said residents were concerned about ‘the appalling state of roads and junctions in the village that are already at crisis point during the morning and evening rush hours’. The basis of the objection would be that the development goes against Clymping’s Neighbourhood Plan – a legally-binding vision for the village – which Mr Humphris said asks for ‘development on a small scale to meet local village needs’. David Miranda, co-chairman of the Clymping Field Protection Group, said between 110 and 120 people attended the meeting, including district and county councillor Ian Buckland and Hilary Flynn, the assistant of MP Nick Gibb. Karl Roberts, director of place at Arun District Council, said: “We are very aware of the increase in traffic related to new developments and the challenges that brings to Arun residents. “Transport infrastructure is a key consideration in the assessment of any development proposal and we liaise closely with colleagues at WSCC who are the highway authority. Mulgrave Properties LLP has been approached for comment.